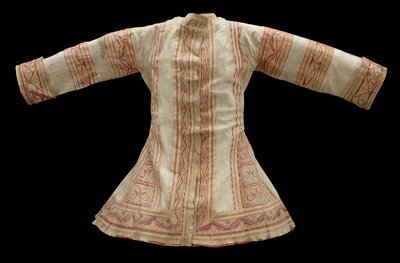 This coat was made to communicate with animals and the divine. In the 1700s, in the far reaches of northern Labrador (now in Canada), Innu (Naskapi) men dressed up in elegant, tailored coats—not to court beautiful women but to attract caribou. Made of creamy white caribou hide and elaborately decorated, the coats pleased Papakassik, an Innu holy being, and mesmerized the animals. Drawn to the coat made especially for it, the caribou would give its life to the hunter.